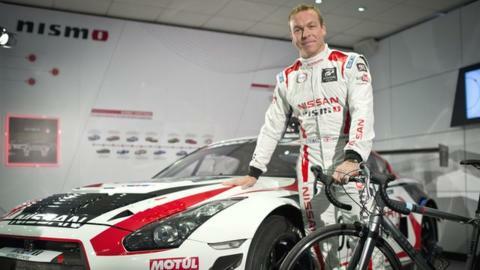 Six-time Olympic cycling champion Sir Chris Hoy has signed a deal with Nissan in a bid to compete in the world famous Le Mans 24-Hour race in 2016. Hoy has turned to motor racing since retiring from cycling a year ago. He has already been involved in track races this year and said he was now looking forward to competing in this season's British GT Championship. "I was keen to take my enthusiasm for motorsport to the next level," said the 38-year-old Scot. "This won't be easy, but I could not turn down the chance to give it a go. "My ultimate ambition is to race at Le Mans. That is the dream, but I'm taking it one step at a time." Hoy, who has also won 11 world titles in track cycling, will now be put through Nissan's advanced driver development programme with the aim of "fast-tracking his evolution into top-level motorsport". The car company is a partner of the British Olympic Association and British Paralympic Association and recently signed Hoy as a brand ambassador to give support to Britain's Olympic hopefuls on the Road to Rio 2016. Now he will drive a Nissan GT-R NISMO GT3 and the company's marketing director, Guillaume Masurel, said: "Sir Chris has already shown that he is a very capable driver and by combining our expertise in driver development, a great car and an experienced team with his natural ability, drive and determination, this will be a fascinating journey."